Researchers at Mayo Clinic have identified an interaction among proteins that allows cancer cells to grow and metastasize. 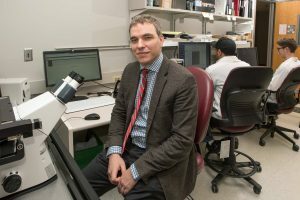 The study published in The Proceedings of the National Academy of Sciences is significant in playing a role in developing a better understanding of how tumors grow in a variety of malignancies, including breast, prostate, pancreatic, colon, lung and skin cancers. According to the lead author of the study Alexander Meves, M.D., a dermatologist at Mayo Clinic, data from this research is helpful in risk-stratifying cancer. “We can determine the amount of cancer-promoting secreted protein in biopsy tissue, e.g. tissue as obtained during a regular skin check. We can then use this data to risk-stratify cancer. For example, we can tell patients diagnosed with melanoma whether their melanoma is low risk or high risk and whether they should consider additional work-up and therapy,” says Dr. Meves. Dr. Meves and his colleagues Tamas Ordog, M.D., George Vasmatzis, Ph.D., Gianrico Farrugia, M.D., and Vera Suman, Ph.D. developed, protected and published methods and materials to quantify skin cancer risk. “With the help of the Center for Individualized Medicine and specifically, the Gerstner Family, we continue to validate these methods and actively pursue their translation into clinical care,” says Dr. Meves. Dr. Meves is one of two 2016 recipients of the Gerstner Family Career Development Award in Individualized Medicine, an award established by the Gerstner Family Foundation to provide early career investigators important seed money to conduct research to predict, prevent, treat and cure disease using individualized medicine approaches. Learn more about the awards here. Registration is open for 2017 Individualizing Medicine Conference. Join us Oct. 9-11 in Rochester, Minnesota to learn how to bring the latest precision medicine developments into practice. For a complete schedule and list of speakers, visit the conference website.